Secret of Mana is the ideal candidate for a remake. The original Super Nintendo game was groundbreaking and, rightfully, beloved to this day, but it hasn’t aged as well as some of its 16-bit contemporaries like Chrono Trigger, Phantasy Star IV, or Final Fantasy VI. Some quirks players gamely put up with back in 1993 are hard to overlook in 2018. 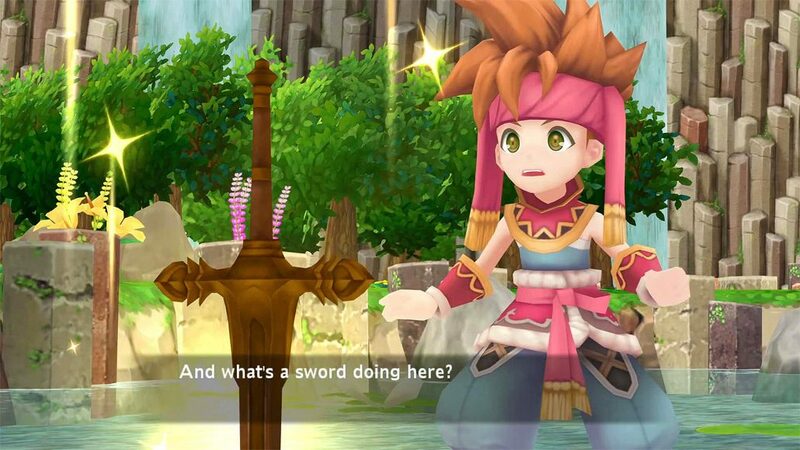 Fans have been begging Square Enix to revisit Secret of Mana for years, and finally, their wishes have come true. Secret of Mana’s setup is as simple as they come. You pull a legendary blade, the Mana Sword, from a stone and set off to repower it using the Mana Seeds held within eight scattered temples. Of course, an evil empire is also planning to use the Mana Seeds for their own dark purposes. Secret of Mana’s overall plot is often barely coherent, but the game does have a fun Saturday morning cartoon episodic quality. Sure, the game serves up its share of typical fantasy locales and scenarios, but you’ll also find yourself delving into strange crystal forests, exploring a technologically-advanced lost city, and yes, fighting a mutated Santa Claus. Secret of Mana’s “nothing is off the table” storytelling ethos still feels fresh 25 years after the game’s initial release. 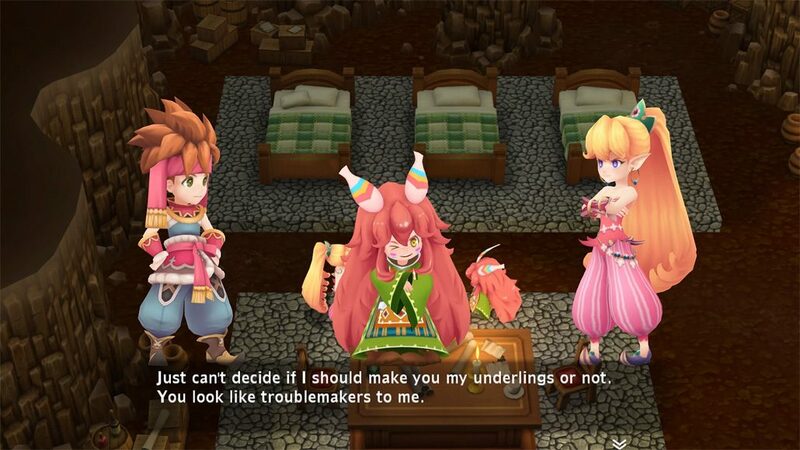 Secret of Mana’s scattered tale is held together by the charming relationship between its three protagonists, Randi, Primm, and Popoi (usually referred to by fans as The Hero, The Girl, and The Sprite, since you’re free to name them whatever you want.) This friendship is the most improved aspect of the remake, thanks to new “interlude” scenes that play out almost every time you save at an inn. These little conversations between your party don’t contain any groundbreaking revelations, but they’re cute and add a bit of depth and color to what could be seen as somewhat stock characters. There are a lot of these scenes, and I got a bit obsessed with collecting them, to the point I was popping into the inn more often than I strictly needed to. The new interludes are a welcome breather, as Secret of Mana is otherwise a very brisk game. You find the Mana Sword in the first five minutes, figure out the basics of the plot within the first hour, and no single chapter or mission takes more than about 45 minutes to complete. This old-school pacing is particularly refreshing after grinding through games like Square Enix’s fatally overstuffed Lost Sphear. The remake gets things moving even more quickly with the addition of a new Game Log. One of the biggest frustrations of the original Secret of Mana was simply figuring out your next step — where does the game want me to go, and what the heck do I do once I get there? The Game Log spells it all out very clearly. Granted, I’ve played Secret of Mana before, but my addled brain appreciated the reminders. 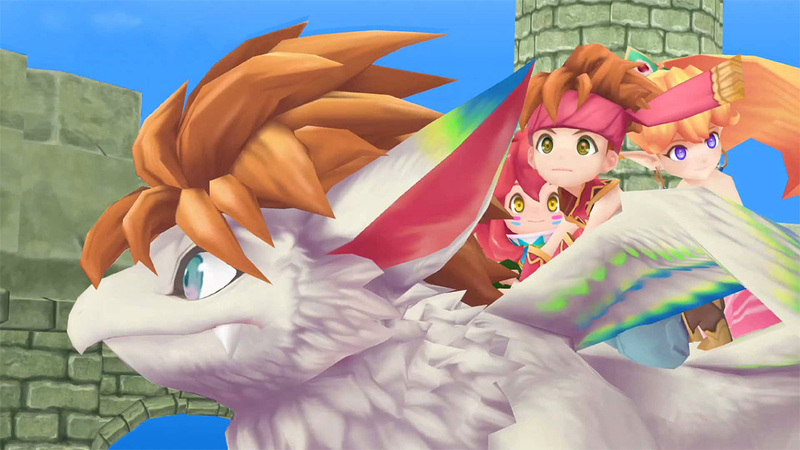 Presentation-wise, the new Secret of Mana is a bit of a mixed bag. I generally enjoyed the updated 3D character designs, particularly the new “bratty little sister” take on Popoi (yes, sprites are genderless, but this version definitely leans feminine). Unfortunately, the game cuts visual corners — animations are often choppy and, oddly, characters don’t move their mouths during cutscenes. This isn’t a bad-looking remake, but it doesn’t live up to its potential. I think every Secret of Mana fan has dreamed of a version of the game that looks like Hiro Isono’s iconic box art, but it seems it’s never going to happen. The new soundtrack is also a bit muddled. Rather than opting for a bigger, more orchestral approach, the remake gets experimental, adding some odd sounds and instruments to the mix. But hey, the game gives you the option to listen to the original 16-bit soundtrack, so some of the less successful remixes can be easily ignored. One aspect of Secret of Mana that hasn’t changed is the combat. As before, you and your two human or AI teammates hack and slash through scores of enemies using different combinations of weapons that you can change on the fly. The action takes some getting used to, as you’re forced to wait for your weapon to recharge every time you strike a blow. The system is expressly set up to prevent the kind of rapid-fire combo-heavy action you see in most modern action-RPGs, which may seem counterintuitive, but it does force you to be thoughtful about your attacks. Secret of Mana never feels like a button masher. There are eight different weapon types at your disposal (swords, spears, axes, whips, boomerangs, gloves, bows, and javelins), each with their own strengths and weaknesses. Weapons can be reforged into more powerful forms using energy orbs, and each character will increase their proficiency with the weapons they use most often in battle. Additionally, Primm and Popoi can use up to eight different forms of elemental magic, which can also be leveled up. On top of all that, you’re, of course, also gaining standard XP and levels. It’s a surprisingly complex set of interlocking systems for a 16-bit RPG. But Secret of Mana’s combat system is far from perfect. Hits often won’t register for mysterious reasons, the magic menu is a pain to navigate in a pinch, and partner AI can be dumb and is prone to getting stuck on scenery. Enemies are also wildly unbalanced – most are easy enough, but those with high Speed stats or the ability to shoot projectiles will cause you serious frustration. For whatever reason, the new Secret of Mana recreates these foibles from the original game as faithfully as possible, and, in some cases, makes them worse. For example, enemies are now quicker and much more capable of mobbing your party. This overly-faithful approach has also been applied to other parts of the game. Shops still don’t provide any information about what new items or equipment do, the cannon travel system is a pain, and manually saving your game works exactly like it did in 1993. Thank God the developers added an autosave feature, because the new Secret of Mana is glitchy as hell. I ran into multiple reset-forcing bugs that would have seriously driven down my score if the game hadn’t been saving at every loading screen. Secret of Mana doesn’t overstay its welcome. Newcomers should be able to finish the game in around 20 hours and vets familiar with its secrets will be able to blitz through even faster. This isn’t necessarily a bad thing. $40 for 20 hours of content is a solid deal, and again, Secret of Mana’s lively pace is one of its strengths. Personally, I’m glad Square Enix resisted the urge to ladle on a bunch of superfluous extras and sidequests, as these types of remakes often do. This review was based on a PS4 copy of Secret of Mana provided by publisher Square Enix. You can purchase a digital code for PC or PS4 via Amazon. 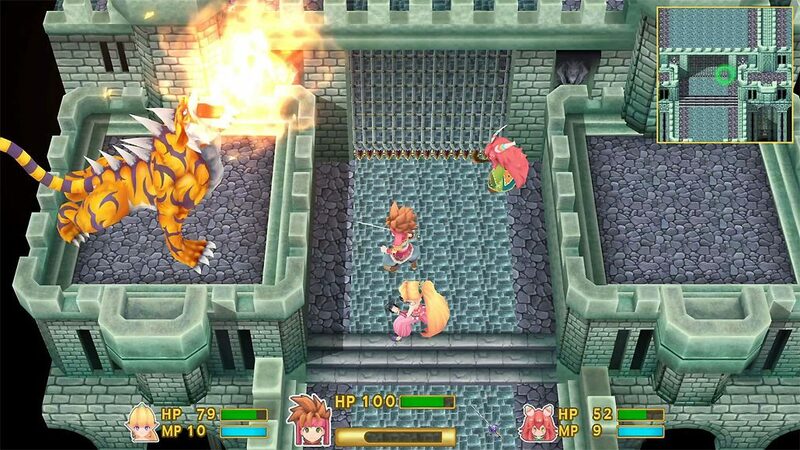 Conventional wisdom would say the new Secret of Mana isn’t a great remake. It doubles down on the stuff that already works while leaving the original game’s most glaring flaws largely untouched. That said, I still enjoyed this new package. Secret of Mana was always about charm and personality over polish. Yes, the game remains a bit of a mess, but that special spark at its core burns brighter than ever. If you loved the original game, or are just in the mood for something light and quirky, this remake strikes true.